The Fort of Ajinkyatara is one of the most important pillars in the history of Maharashtra. This hill fort was under the control of Shivaji Maharaj during the 16th century and has seen some of the most important events of the Maratha and the contemporary history. The word ‘Ajinkyatara’ literally means ‘the impregnable fort’. It is one of the most stunning specimens of Maratha architecture in Satara. The fort provides a spectacular view of the entire Satara city and is a popular place of sightseeing in the current times. It is based at a height of 33000 feet or 1010 meters above the sea level. Tourists can see the TV tower for Sighhagad in Satara near the fort presently. It also has the TV Tower for Pune. The fort is a great tourist attraction as well. The place around the Ajinkyatara Fort is one of the perfect trekking grounds of Maharashtra. Hence this place is suitable for the trekkers who are mere beginners. The place receives less amount of water in terms of rainfall. The fort was the capital of the city in the 4th century and was conquered by the Marathas under the leadership of Shahu Maharaj. Since then till the year 1818 the fort was under the control of the Marathas. This is the same fort where Tarabai was imprisoned. This fort when under the Mughals was known as ‘Azamtara’. The fort derived it name from the Mughals; when it was captured and won over by Tarabai from the Mughals, it was then named as ‘Ajinkyatara’. 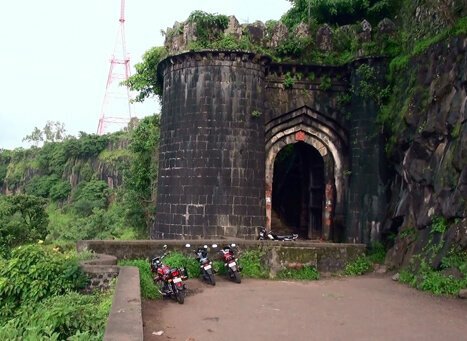 The fort is located in the Satara City. It is about 115 km away from Pune. Hence this place can be reached through rail and road. There is a great state bus service system that can be availed. At the same time there are a number of trains from The Pune junction to the city of Satara. There are many places to visit once you have come down to the Ajinkyatara fort; namely the famous hanuman temple that is large enough to house at least 12-13 people. There is also the Mahadev temple that is considered very powerful by the local people. The Bastions on the fort are worth a watch. One can also see the famous Tara Rani’s Palace that is one of the most eminent historical places of the fort. The popular Mangaldevi Mandir and the beautiful lakes of the fort are lovely glimpses indeed. There are no entry fees for the fort. The Fort is open all across the year on all the days. However the tourists are advised to come down to the fort during the morning hours to get the best view, it also ensures the safety and the security of the visitors. It is a popular trekking spot or an overnight holiday spot. The best time to visit the fort is during the winters. The fort should be avoided during the monsoons. Even the trekkers must come to the place during the winters. During both the summers and the winters the temperatures reaches quite extreme points.